Bali is the perfect holiday spot for ocean lovers. All ocean lovers! It doesn’t matter whether you’re into surfing, diving, snorkelling, skinny dipping under the moon or even just laying on the beach. Bali has some epic spots to visit, and the Indian Ocean is warm and welcoming. We recommend you book yourself a lush villa in the Seminyak area, then take a couple of day trips around the island to explore. 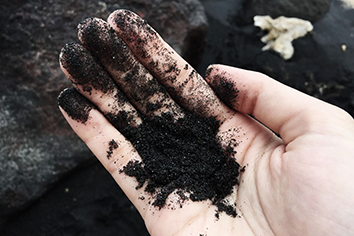 Read on to discover some hot spots for ocean-loving visitors. 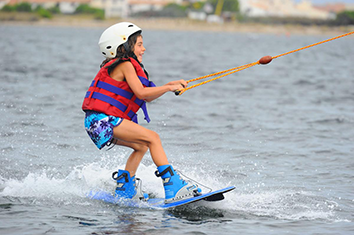 We’ve included a range of water adventures for the whole family below, but don’t hesitate to get in touch if you’re looking for information on a particular spot. We may have the perfect place to stay nearby, and our villa managers can help you to plan your tour. The Bukit Peninsula is epic and Balangan is one beach that’s perfect for both beginner and more advanced surfers. The beach is dotted with warungs that serve tasty food, there are places you can rent a board. You can also usually find surf photographers poised to snap you in action for a small fee. Balangan is famous for its pristine white stretches of sand and has two main surf spots. The most well known is out the back on the cliff side. Visitors describe it as a racing barrel that’ll get your heart beating! It’s a left-hander that is perfect at mid tide if you’re looking for an overhead swell – but beginners are also safe on the small waves closer to the shore. Nusa Penida is one of the top three dive spots in Bali. 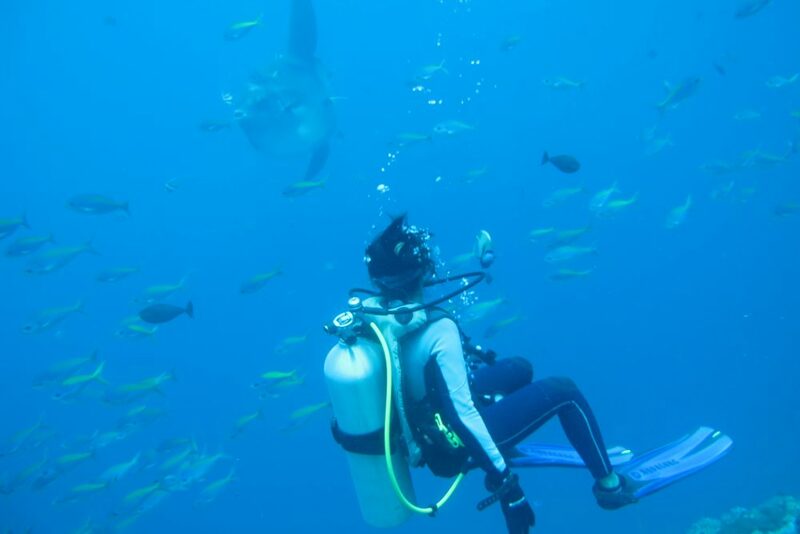 You’ll take a 30-40 minute boat trip from Sanur to get there, and you can expect to visit cleaning station sites where the majestic manta ray and Mola Mola can be found. There are often white or black tip reef sharks cruising around in the distance, and we’ve fallen in love with the giant hawksbill turtles that like to munch on the coral formations. 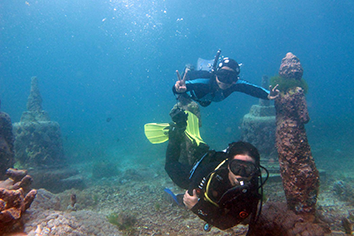 There are both PADI and SSI dive schools with experienced dive guides who’ll rent you the gear and look after you in the current. 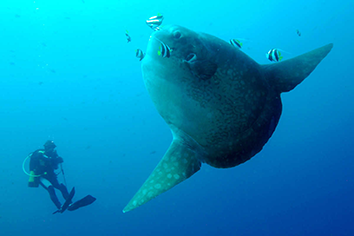 Nusa Penida has some advanced drift dives, and the biodiversity is world-class. You’re likely to see everything from pelagics to nudibranchs, and on a good day, the visibility is up to 30 meters. 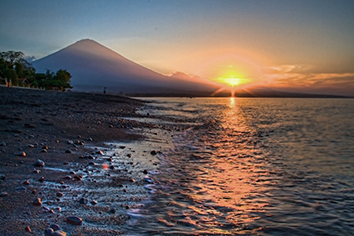 Amed is in the North East of Bali and makes a lovely weekend adventure. The village has a very laid back vibe and is perfect for long sun-drenched afternoons on loungers or just drifting in the ocean on your back as you look up a the sky. Tulamben is also very close to Amed so if you like snorkelling, treat yourself with a visit to see the coral formations and the tropical coloured fish that call the HMS Liberty Wreck their home. This wreck is lovely for divers if that’s your thing, but it’s submerged at a shallow enough depth for snorkelling too. You can easily rent flippers on site and enter straight off the pebbly shoreline. 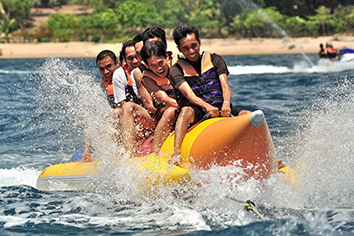 If you’re into boating, wakeboarding or skiing, then the Benoa Harbour is the place to go. You can choose from parasailing, jet skiing, banana boating and so much more. There’s a private dock, and you can combine a range of water sports activities into one long day of hilarity. If you’re not a wakeboarder, we recommend you try parasailing 80 meters into the air, jet skiing or even being pulled around on a donut. You can also take a glass-bottomed boat to turtle island to check out the sea life. At certain times of year baby turtles hatch, and it’s a wonderful experience to watch them crawl across the beach and into the sea. Bali is an excellent holiday option for Australians and anyone based in Asia as it’s just a short flight away. The island boasts an affordable and fun atmosphere where it’s warm all year round. In most cases, you can walk to one of the local beaches from your villa in Seminyak, but if you really want to explore the Indian Ocean, we recommend a day trip where you leave early in the morning to beat the traffic and make a camp for the day. There’s nothing better than being close to the sea, whether you want to listen to the waves crash on the beach or float weightlessly in warm water, Bali is just one island in Indonesia’s stunning archipelago. A holiday here can be dedicated to rest and relaxation or an adventure trip you’ll never forget. Feel free to check out our website here. We have a range of beautiful villas all over the island that are just waiting for you to make them your home.